Please share your experiences with Xeljanz on the comments page here. Patient stories are starting to come in across the blog and I thought this would be more convenient for others searching for answers. Here’s my story. Two years ago, my rheumatologist recommended I “just wait for something new to be approved” as a DMARD or Biologic for Rheumatoid Arthritis. Some of you know that’s when I requested the bone scan and looked for a clinical trial so I could try Rituxan. And, most of you probably also read here that Xeljanz, the first new type of chemical DMARD for Rheumatoid disease was approved in November. In December, I saw Dr. Tylenol and asked again about tofacitinib, now Xeljanz. Katie Beth and I knew a lot more about it after three years at ACR meetings, but we didn’t let on. It was agreed a prescription would be set up through the office person who handles that. A couple weeks later, a lovely pharmacist called to inform me that my prescription was approved with no special preauthorization required. Her pharmacy would also accept the copay card from Xeljanz so that my cost would be FOUR dollars, after insurance. Of course I know about copay cards and recommend such programs to patients all the time. But this was the first time I’d succeeded in getting one accepted for payment! Pfizer and this pharmacist certainly made it easy, but perhaps it was also simpler because tofacitinib is in tablet form, not infusion. 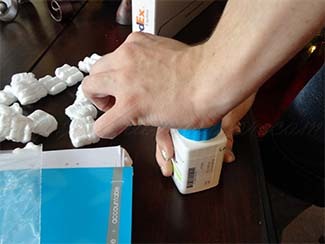 Several patients in our community have reported receiving free sample packs of Xeljanz through their rheumatologists. The pharmacist told me that sample packages contain two weeks of doses of tofacitinib tablets. Some doctors are giving patients two sample packages, which means a patient tries the new drug for a month free. 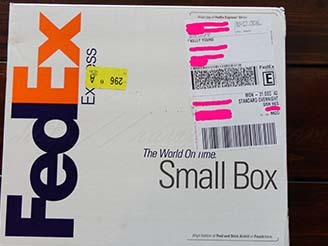 New Year’s Eve, the Xeljanz arrived by the same FedEx guy who has brought me Redskin tickets several times. We chatted about RG3 (Robert Griffin III, our quarterback). When Katie Beth got home, she opened the box and took pictures of the loot. Then I put the bottle away until my vaccination waiting time ended. Today is four weeks since my shingles vaccine. So after my blood tests and pneumonia shot today, it will be time to find out. I’m nervous the same as with any new medication. But I’m also hopeful that this will finally be my opportunity for some relief. Daily low-grade fevers. A jaw that won’t open for a few days so it’s difficult to eat or talk. A neck flaring so badly I can’t hold up my head. This is how it’s been for almost seven years. If I walk very far, the usage principle kicks in so that I can’t walk at all. My abilities are restricted by the disease because there is always some unexplained “sprained ankle” (“flare”) in an ankle, knee, shoulder, wrist… anywhere. Never a “normal” day. A day of less pain means I decided to rest, work sitting still, and take needed pain meds. It always surprises me when a friend asks me anything that sounds like “Are you better yet?” Although I season it with optimism and allow God to use it for good, in many ways the past few years have been HELL. Having lived almost seven years this way, with abilities restricted and constant joint pain, I try not to complain. But when I improve, I will certainly say so. Out loud. Please share your Xeljanz experiences in the comments box so other readers can benefit. Hi Kelly. Please let us know asap how you find the new treatment Xeljanz. I am still on Cortisone, Celebrex, and methotrexate, which does not still the pain for one moment. Maybe you just find the utopia (in the Rheumatoid Disease world). I was wondering if the Xeljanz will replace a med you are already taking or if it will be in addition to? I feel like I take a ton of medicine, and wouldn’t it be great to take a few less pills in a day 🙂 Have the best day you can. I have read that Xeljanz will be used alone, without DMARDS. Mainly in cases of Methotrexate failure. I am praying that this works for you. I know all to well what you are going through. Praying that this drug will give you relief from this horrible disease because although it’s only been a few months since I was officially diagnosed, I know how it has already turned my world upside down and I’m still reeling from the shock, I can begin to fathom how much pain you’re in and the daily struggles you face. Here’s hoping this is the new wonder drug! I am wishing you the very best of luck Kelly. I don’t know how long it’ll be before we get this med approved over here in the UK, but I’ll be asking my rheumy if it’s available yet as I’m about to discuss a meds shake up with him. I also have a friend who is about to begin this treatment and I’ve pointed her in the direction of this post. I have my fingers metaphorically crossed for you both. rawarrior Good luck with the Xeljanz Kelly! Really hope it provides some relief! Kelly, I am right there with you! I was diagnosed with RA about 10 years ago but have never had symptoms as severe as the ones I am currently experiencing. I too have low grade fever 99.6 to 100.3 everyday. My knuckles are so swollen they look like a train wreck. Everyday one of my ankles hurts so bad you would think I twisted it somehow. Where do we go from here? I am changing rheumatologists because mine has decided to prescribe orencia and said I’ll see you in 2 months. His nurse even told me to have my Internist look me over to see if something else is going on! Seriously, it is so obvious this is a really bad situation and I feel sure he does not not know where to go from here! I also just started on Xeljanz today. I am hopeful this will do the trick. Flare ups have been constant with all the other meds. I have been on Embrel, Humira, Orencia and this is my next step and so glad it’s in pill form. I saw the cancer doctor last week at the infusion center where I get orencia (I see him every 6 months for no particular reason) and I told him about xeljanz and that it was a jakbase inhibitor. He immediately googled it and told me that they use a more limited jakbase drug for some blood diseases. I so much hope to hear that this drug is awesome. I asked my rheumy about it and he was cautious about how long a person would have to wait to get a biologic out of their system before starting another immune suppressing drug. I hope “tofu jello” is amazing for you. Yum. I could only pray after hearing your story, when will anyone here our cries! He live away from the world and everyone we come in contact with think we look great. I just wish they all new what a struggle it is. I pray for you that they find something that will work for you. I am on the way to get my infusion of Orencia. I just spent 4 weeks on Xeljanz. It ended up being like taking nothing at all. I’m in the worst flare in 5 yrs. Yesterday saw my doc and decided that my flare was severe enough and so rapid on the Xeljanz that I’m going back to Enbrel, in combo with Arava (a combo I haven’t tried yet). I know the Enbrel works about 25-40% for me, and the Arava another 20-30%, so I’m hoping to be able to get back to not being in horrific pain 24/7 from my Xeljanz experiment. Good news about Xeljanz: I had no side effect, and I tend to get side effects from every med I take. I wanted to give a lab work update: after a month on Xeljanz, my lymphocytes dropped by half into the very low range. Not good. I *really* hope Xeljanz works wonderfully for someone else! I’m really disappointed in how it didn’t work for me. Sorry to hear it! Did you have to go off it right away? Did you have to do anything else? I love how explain how you are feeling! I love how you try not to complain! I am the same way! I am constant pain. People always ask me if I am btr yet. My husband is in some sort of denial in regards to having RA. He constantly says he is worried about me because I have all these problems and pains. He says he doesn’t know what is wrong with me and states I should stop all he medications I am on. I just want to live pain free without people around me asking me that. I’ve been reading all the reviews about this drug and it makes me a bit nervous. After reading your comment I had to respond. My husband also seems to be in denial about the amount of pain I’m in and thinks I shouldn’t take all these drugs. However he has no clue to the amount of pain I live with daily. It’s unbearable! I am in constant pain, not just with so-called flare ups. My rheumy just had me start xeljanzn. I took the first one this evening. I am praying it helps as I’ve tried the metho oral, metho shots and enbrel shots. They either didn’t help or had bad side effects. I am truly hoping this helps as living with this kind of pain that is literally EVERYWHERE in my body, not just the joints has gotten so much worse over time. It started just as twinges in my right shoulder 5 years ago, and now the pain is worse, constant and everywhere! I am only 49 and worry I’ll never find relief and will continue to get progressively worse. Starting to think maybe it could be something else besides RA??? Finally a new drug. I have been without RA rx for almost 2 yrs , since I lost my insurance. My Rhuemy won’t see ppl without insurance and only a handful of RA specialist in my area. Hope this drug works for everyone trying it. I keep a list of anything new so I can be more informed..
My rheumatologist started me on xeljanz 1 a day on 12-19-12. I have had more flare days than good days since then. Methotrexate and Arava lowered my white blood count so much I had to quit taking both. I started on 2 a day 2 days ago. I am hoping this works. I hope so too Janet. Sounds like an interesting approach your doc took. Keep in touch! I visited the Rheumatologist yesterday, my white blood cell count was in the normal range for the first time in a year!!! Inflammation is down and my hands and feet feel much less painful, and this is after being on xeljanz for just one month. Hopefully, this will continue. Kelly, I hope you have as good of results from xeljanz as I have had so far. Even if I am in less pain for a month or two, I will still be thankful for that. Kelly I hope this works for you…it’s been a LONG time…I will be waiting to see how you do with your new drug! thank you so much Susan. I really hope so. It will be about a week before I start I think. Dr. GP was more comfortable with that after another vaccine today and a TB test. I’m wondering if others who are starting Xeljanz are continuing with methotrexate in addition. I started XJ on 12/14/12 and stopped methotrexate about 3 weeks prior. I’m doing ok, with celebrex twice daily, but can’t do any less than that. I’m thinking about starting mtx again, but don’t want to because of the toxic effects. I was hoping this was a drug I could take and not take mtx. Still hoping. I’m thinking I should give it about 3 months to show any benefits (?). I just go by what is on the Internet. My doctor is pretty much no help other than to write the script. I’d love to know what others are doing. great questions Annemarie! and I hope others will share as time goes by. As for me, I also stopped the long-term mtx recently. There are clinical trials with and without the mtx. Maybe I can try to dig deeper into those too for any information. And I agree with you, I probably would not give up on it before 3 months either, although I would think you’d see some sort of sign of improvement much sooner than that. Hi! My Rheumatologist just prescribed this for me today since Enbrel, Humira, Orencia and Actemria haven’t worked for me. She advised me to continue my mtx weekly and Arava every other day. I hope it helps you Julie. I hope this works for you and that you find some relief. I am supposed to start my first Biologic in February, so I am just starting this roller coaster of meds and hoping to find one with a short line to feeling better. I had to comment on one of the pictures… Did they really send it with a child proof cap? Kind of funny, since I can’t open those bottles if you paid me. yes, that’s right. KB said “It took me forever to get that thing open.” I guess I could tell the pharmacy I want it in an accessible bottle next time. Thanks for the good words. I hope you get relief also. I got an email later from a marketing company saying that the Arthritis Foundation approved the cap for Xeljanz – they are all the same, regardless of pharmacy. The email was questioning whether the cap was actually hard for rheumatoid patients – they were just shocked to hear it here on the blog. 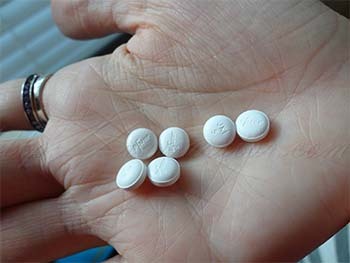 Reading more about the drug…It may be used as monotherapy or in combination with methotrexate or other nonbiologic disease-modifying antirheumatic drugs (DMARDs). That was my first thought when I saw the photo too. I now have a note at my pharmacy to say that all my meds need to be in easy off capped bottles, no blister packs as I can’t cope with them. I am still on 1ml injectable once a week of methotrexate along with this new drug. I’ve been on “JAK” (as my rheumatologist calls it) for almost 3 years now. I was diagnosed with RA in October of 2009, and was put on varying dosages of prednisone for the six weeks before an appointment could open up with my rheumatologist (and when I got there, she said, “Your family doctor should have pushed to get you in earlier — you’re the kind of patient we want to see right away!!”). But because of that, I fortunately qualified for what was then the end stages of the clinical trials for JAK. Because the maximum dosage of pred had to be reduced to 10 mg. before the trial could be started, I only began taking JAK in February 2010. I was also given Plaquenil to supplement. It took a few months before I saw results — probably about two or three, but the difference when the JAK took effect was pretty miraculous. When I was first diagnosed, I was in such incessant pain that I lived on Vicodin and Advil round the clock. I couldn’t sleep for more than an hour at a time. I walked with a cane, and painfully at that. Today, I don’t use a cane, and most days, after the initial morning stiffness, I walk with almost no difficulty (although I still can’t walk for great distances, especially on hard floors or surfaces). I still have my bad days, but since I also have fibromyalgia, I never know whether it’s the RA or the fibro that’s causing the pain. According to my rheumy, though, there is no sign of RA in my body. My inflammation levels are normal for the first time in many years. So that’s my experience. Now…what it’s doing to my body in the long run, I can’t say. It has the same side effects that most of the biologics have, which means a possible increase in the rate of lymphoma and other cancers. I have to admit that scares me. But there is NO way I could go back to the way I felt when I first diagnosed. I don’t know how I could live with being in that much pain, and being that disabled. So in my case, the benefits obviously outweigh the risks, at least for now. For me, JAK has been a godsend. And I only hope that when my clinical trial period is up (Pfizer has agreed to pay for us guinea pigs’ JAK for two years past the time the drug was approved) that my insurance company will agree to pay the cost. I’ll cross that bridge when I get to it, I guess. So that’s it…sorry for the long response, but I only hope that for those who are only beginning this drug, you have as much relief and success with it as I have. Especially you, Kelly! I’ve read about your pain and suffering, and I can only pray that it works for you as well as it has for me and the others it’s helped! Xeljanz is now being clinically trailed as a drug to help with IBS symptoms. Perhaps this is why the drug has helped your stomach as well? Good luck, keep me posted if you can… I start Xeljanz next week. Ah Xeljanz…my rheumy told me that they make up nmaes with X and Z’s because patients trust them more. I don’t know if I trust it more, but it has been an interesting three weeks. Usually with most medications I see a quick positive followed by a rapid decline. Actemra worked the longest for me, at six months. By the time I went off Actemra, I was back to bad flare ups and increased tendonitis and synovitis. My elbows are my worse right now. Elbows! It just makes me shake my head. They’re not even weight bearing! The improvement on Xeljanz has been slow, and I have gathered some hope from that. If it is working different, perhaps it will work longer. I know that may sound unreasonable, but I will grab hope where I can. I have no side effects wtih Xeljanz, and for me that’s a BLESSING. I’m the side effect magnet, I’ve had headaches, dizziness, vomitting, and hair loss. As far as other medications that I take with it, I take Sulfasalazine (I’m not sure why I’m still on this, but my rheumy swears it is still doing some good. This was my first medication.) Relafin. Tramadol. Those are my RA meds. Actemra was doing some awful things to my labs, so I’m hoping the Xeljanz will be tolerated better. As far as payment goes, yes it is listed under the specialty meds for me. No one in my town carries it, so getting it by mail is my only option. I did in fact get my first month free (Drug rep at my rheumy’s) will be getting 2 weeks free from the manufacturer, and after that my prescriptions (With the copay card) will be $4. Heck of a cry from Actemra, where I was paying 400.00 / month. Will keep everyone updated as time goes on. Good luck to you, Kelly, and everyone else who is hoping this will work. I’m there with you, keeping my mental fingers crossed. Good luck Kelly! I have been on Xeljanz for a month now, and at this point have yet to see any difference from it. I did notice that upon starting it , I was nauseous for about two weeks as my body adjusted to the drug -not sure if an else has experienced that or not? At this point -or until something new comes out- this is the last drug to be tried for me. I have run the gamut, and have tried everything available for RA up until this point, to no avail. Trying…to get -and keep- my fingers crossed on this one! I hope the Xeljanz will work for you. I have had RA for 25 yrs the last 3 have been horrible. I have been through almost all biologics, currently on Actemra and only getting moderate relief. Rituxin is up next when this fails also he has mention the Xeljanz. I was concerned about cost since this goes on prescription plan rather that Major Medical. I just need to get better relief from the pain and flares. I have failed so many drugs that I feel that moderate relief is better than no relief. I will be watching your blog to see how it works for you and pray for good results. It is so nice reading all of your posts and not feeling all alone. I have just been diagnosed after 8 months of unusual symptoms, and it wasn’t until my toes puffed up, very painful, etc. and the bone scan and RF, etc that I was diagnosed. Until then, it was doctor after doctor. What confused me were episodes of an extremely stiff neck and back of the head headache that lasted 12 days with no relief. I went to the ER twice, my primary twice. No help whatsoever, but I had to use my hands to lift my head from the pillow. Unbelievable. Then swollen nodes and fever. Earlier I started having muscle cramps, like dystonia, all over my body, every 5-10 minutes for a week..then fever. The joint pain I’d just lived with, thinking osteo. I wonder if others have problems with stiff neck and muscle cramps, as I rarely see it mentioned. The muscle or tendon cramping or locking up is common I think. I remember asking my rheum doc about it a few years ago and was told it’s common and there’s not much that can be done. I tried increasing potassium & magnesium. I use a mild muscle relaxer sometimes. Glad you found us Wendy. Good luck with everything. Wendy, I don’t know about others, but I’ve got problems with muscle cramps. I’m never sure if that’s from my fibromyalgia or due to the RA. All I know is that pain is my constant companion every day, though nothing compared to how awful I felt before I was under treatment. Wendy, I spoke to my rheumatologist about this as well. I have very sore shoulders,neck and tendonitis in my upper arms. It is quite painful. He said without hesitation that it was RA. After 25 yrs of this I should be used to it. It still amazes me all this disease can do. I take actemera, methotrexate, prednisone and placquinil and I get some relief from Celebrex. I figure this is a new kind of flare with the neck and shoulders. I have also found that the Volteran gel work, but with so many meds, it’s hard to know which one helps the most. Praying for some relief for you. Like many, I’ve run through most meds available to us over the past five years. Each new med brings hope. I’ve just come out of a very dark period when it was determined Actemra, which worked for 1-1/2 years, was now the cause of lengthy and severe pain/flares both shortly after an infusion and for two weeks after. For the past two months I existed on Mtx alone to ‘clear’ my system so that I could begin Xeljanz. After starting on this new med four days ago, today was the very first day I woke up and actually got out of bed before 9:00 a.m. Are my flares down? Is the med working? I hope both are correct statements. In addition, I would love to no longer be tethered to a tube on a monthly basis so the ease of an oral med is a plus. Like all the earlier meds I’ve taken, which eventually lost their efficacy I say, “It’ll work till it doesn’t”. Good luck Lisa! Let us know how you do. I’m not having much luck on Humira and I’m maxed on mtx. Interested in any updates about this new med and how it is working for you. Thanks. I am currently 40 years old and was diagnosed with RA at age 17 ! The last 3 years have been flare city, causing two ankle fusions, hip replacement, and knee replacement ! I have been on ARAVA, METHOTREXATE, PREDNISONE and MELOXICAM for the last 10 years ! They stopped working and the flares so I went on REMICADE which I had a severe reaction too. Then I tried ACTEMRA for a year and it didn’t work! Well I just started taking XELJANZ on 01-17-13 and I feel pretty good so far. I was having horrible flares before starting the XELJANZ so fingers crossed that its going to provide me some relief ! I am so sick and tired of Methadone for pain and watching all my friends hike and go like crazy while I sit home in agonizing pain month after month ! Only those of us fighting this wicked disease truly know what each other is going thru ! Come on XELJANZ do us all a favor . . . PLEASE ! 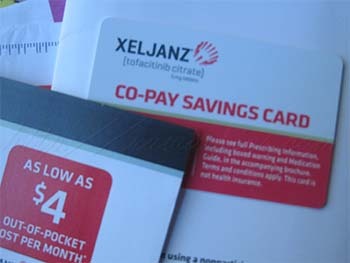 Does anyone on here know where can I get a XELJANZ co-pay card ? Will the co-pay card work with Medicare ? I know a lot of them don’t and its terribly Frustrating ! Oh and I go in on the 31st of Jan for my first blood work to see what the XELJANZ is doing ? Good luck with it Darren. Yes the samples are discussed in the post. Doctors who work with pharma rep samples can get them (mine didn’t). The copay card comes through Xelsource here http://www.pfizerpro.com/xeljanz_landing/xelsource My pharmacy helped me, but the process is simple. And US government regulations create policies for programs with regard to Medicare – so if it doesn’t cover you, I’d make some calls to both Xelsource & my representative asking “What do you expect me to do?” Let us know what happens Darren! I will let you all know how it ends up working for me ! Nothing Else has worked in a long time so I am trying to stay positive ! Remember – As my sister tells me ! There is a special place in Heaven for people that suffer with this wicked RA while here on earth ! I just want to give an update. I’ve been on XJ about 6 weeks now, without mtx. I’ve decided to add mtx again because I’m actually not improving but going downhill (more joints flaring than 6 weeks ago). I’m also having some side effects – I think. Or, its just me. I’ve been very bloated, retaining water. Very thirsty, to the point I can’t sleep because I’m having to get up to get water a few times a night. Also lots of sinus problems. I’m going to stop the xj for a few days to see if these conditions improve. It could be something else I’m going through because when reading about xj the only side effect they list is sinus, not the excessive thirst. I started Xeljanz 1/14/2013 and it worked immediately. Humira made me feel 18 again the first time I injected it and periodically throughout the first year, but it didn’t seem to work the last two years. I hit absolute rock bottom recently with trouble showering, getting dressed, and even walking. I received a handicap parking pass which was helpful when I had to limp around a lot. I really couldn’t do much of anything, or even reach over to lift a cup. I decided on switching medications as a New Year resolution and my rheumatologist suggested to try Xeljanz. So far I have had no side effects. Xeljanz makes me feel energetic and I was surprised by the burst of speed getting in and out of my car and walking back and forth. I think I’ve gained 70% mobility back. I know I have regained my confidence, peace of mind, and I feel happier and willing to do more. My rheumatologist may not have known about the free 30 day supply, but he gave me the copay card and I qualified for $4 a month. I’m so glad for you. Thanks for sharing your hopeful story! How are you feeling on the mew meds? Any side effects? I’ve been taking it a few days but haven’t noticed anything yet. It would be so dramatic to regain any ability that I’ve lost I’d be sure to say so – probably from the highest rooftops. I used to be sure to say “I think it’s working” and search anywhere I could for a change but not anymore. If it helped, I’d know it for sure. I’m a 52 yr old male- diagnosed with RA about 11-12 years ago. 7 years ago Dr added fibromyalgia. I’ve been on all the different infusion meds- some helped for a while then stopped – some made me so much worse- Orencia seemed to help but gave me debilitating migranes. Tries going on and off 2 times- both same results. I was told about a year ago that there was nothing really left. About 6 weeks ago I was put on Xelanz. To date, aside from feeling my stomach torn up, on and off headaches and overall just really crappy- I have seen no benefits in my RA symptoms. I feel for each and every person on here. I would not wish this disease on anybody. Unfortunately it’s what we all have to deal with. I think the hardest part is the vicious circle of having to work just to pay my medical insurance and medical bills so I can try to function. And taking these drugs just so I can get to work. Seems like a sad and sorry existence that few understand. If I say a prayer for all of you, and just one person has a better pain day today, then that’ll make me very happy. Well said Bruce, although I’m sorry it needs to be said. How long does your doc think you’ll try the Xeljanz? He says it could take months before I see any changes. If I feel like crappo for 2 or 3 solid months- ( and by crappo- I mean additional sickness on top of usual ) without seeing or feeling any benefits, I’ll go off it myself. Thanks for responding. I appreciate the support. I’m in the same boat Bruce. Just a few days into it now. Not sure yet if any stomachache or headache is side effects or not – I’m cautious to assume anything with such complicated health. Yea, I’d think by then for sure – I’m trying to decide my time limit too. I’ll poke around the clinical trials to see if there’s anything to go on with that and blog about it if I find out. Although I already had the distinct impression it acts more quickly than some other things most of us have tried. Didn’t read thru all the blogs. How long you’ve had RA? anything else in addition…extra bonuses like fibromyalgia or ??? There was a doctor who suggested I had FMS but I don’t fulfill the diagnostic criteria. He didn’t examine me or give me a questionnaire. He was just dismissing my RA because he didn’t see conspicuous swelling from the other side of his desk. I don’t have muscle pain or generalized pain, or trigger point pain etc. My symptoms are all joint related except for the fever, eyes, and vascular symptoms. I have thyroid disease, lifelong but well-controlled. And the usual that seems to be common with RA of osteopoenia, Sjogrens syndrome, and vaculitis. Also degenerative disks and some spine damage due to rheumatoid. I now think I’m pretty typical, after having had contact with thousands of patients. And THAT is the most I’ve said about my own disease in one place before. We ought to do a survey to find out if there are similarities in who responds to what. I’m 52 year old retired army. After a couple of hip surgery’s and a new knee I was diagnosed with RA. This was about 10 years ago. I’ve been on methetrexate Humera Prednisone and remecaide. The remecaide seemed to help the most un til I was taken off of it for a short period to recover from a surgery, I was allergic after the restart. Now I will start this new drug XELJANZ tomorrow. I hope it does good but who knows? I have found no positive results in my searches so I will have to see how it goes here. Good luck Terry. I hope we all do. Thanks for the well wished ms Kelly. I was on the XELJANZ for a month. I had severe swelling in my knee and the doctor diagnosed as celluitis? I was told to stop XELJANZ and start antibiotics. I did this for 2 weeks. I started back on the XELJANZ and it made my pain much worse and I had to discontinue. I will update after I speak with my rheumatologist. sorry to hear about the complications. I hope it gets better. I started Xeljanz late January and so far I have been doing somewhat better but no dramatic change. I had gone back on Humira after the other biologics, Enbrel and Orencia, didn’t work and/or were not well tolerated. Humira had been a wonder drug for me — had me in remission for about the first five years after my initial RA diagnosis 9 years ago — but it no longer stops the pain and swelling. I was taking methotrexate as well, but had a nasty reaction late last year and stopped taking it. Over the last year, I have had horrible reoccurring Baker’s cysts behind the right knee, plus pain in my hips, the other knee, and sometimes feet, that have me limping on and off. I am disappointed that I have worsening swelling and pain in my finger joints of late, even on the Xeljans. I am going to give it 3 months. If the XJ doesn’t work, I don’t know what else to do. In any event, I will report back. Thank you all. Sigh…pretty sure I will be moving onto this in a few weeks. Actemra appears to have stopped working after a surgery (3rd synovectomy on same elbow within 5 years and removed radial head this time) despite doubling the dose. Also “failed” Enbrel, Humira, Orencia, can’t tolerate MTX, major rxn to sulfasalazine. The question running through my head after all of this is exactly how common is all of this biological “failure” seems that they are promoted as wonder drugs, but I also know a couple people in my life that have also been going through the drug parade…thoughts? I have been taking xeljanz for a month and at first it was quite effective (I was in a really bad 3-4 month flare). I had slight nausea/stomach pain for the first 2 weeks. Then I starting having insomnia (from sleeping 24/7 to not being able to sleep at all). I am up until 2-3am having an awful time with that. My cholesterol jumped and is now high and doctor said might need to start a cholesterol medication (that’s not going to happen). Ironically, I have had a problem with high triglycerides forever, they were very high in December, on this lab test totally normal. I have also had several episodes of heart palpitations/shortness of breath (folded a blanket, felt like I had run around the block). Doctor does not know if it is related to the medication or not. Tuesday I had a horrible episode of severe upper abdominal pain (stabbing) accompanied by vomiting and diarrhea. The stomach pain did not let up at all for nearly 11 hours. I almost went to the ER, but I just could not make myself. I was in agony. I believe this was medication related as it was the same stomach pain I had initially, only in the beginning that pain was milder and didn’t last long. Also, I had no other signs of being ill. Today I woke up with that feeling both my wrists were broken, it was hard to get out of bed. My right hand was hurting all day and my pinky on the opposite hand swelled up (I rarely get swelling) and was very painful. I do have to have to see my rheumy and have labs monthly, so we will see how this goes. Really on the fence right now. No doubt I am better than I was in December, but the side effects may just be a deal breaker. While the Pfizer copay card may be beneficial to many, any readers that are federal employees should be aware that Pfizer, like Genentech, has decided that the Anti-kickback statutes (which prevent the use of co-pay assistance for those on programs like medicare and medicaid) also apply to federal and state employees who have any part of their health insurance premium paid by the federal or state government. It does not matter that the employee also pays part of the premium. As a federal employee covered under the Federal Employee Benefits Program, both Pfizer and Genentech have deemed me ineligible for copay assistance. Interestingly enough, Walgreens is doing the same thing, so that their “Balance Rewards” program excludes federal employees. Have you spoken with a representative of either company to ask why they interpret the regulation this way? Do you know if other pharma companies are doing the same with their programs? I’ll see what I can find out. I just posted on March 16th, and I just want to tell those who are experiencing stomach distress that you might try taking probiotics to ease your symptoms. I started having gastro problems on the XJ and found relief by taking the inexpensive Walgreen’s house brand of the Align probiotic supplement. I used to suffer from irritable bowel syndrome (IBS) and I learned then to look for probiotics containing B. infantis. It can be found in the refrigerated powder form at health food stores. The Walgreen’s comparable brand is just one tablet a day and does not need to be refrigerated. Anyway, it seems to have worked for me. I am just now wrapping up my third month of Xeljanz. No marked improvement, but no further decline (and these days, that could be counted as progress, too!). My doctor started my on a loading dose of 10mg twice a day and I had immediate relief after the first 3-4 days and for the first two weeks. When I went back down to the regular 5 mg twice a day dose, I did have more joint pain than before BUT so far it is manageable with Tramadol. My sed rate remains too high, but I will go back for another blood test next month. Hoping to see improvement then. I have already failed on Plaquenil, Humira, Actemra, Remicade & Enbrel. It would be nice to find something that works. Dear Courtney, I hope you and your doc can find something that gives you better relief. Would he be able to prescribe the 10 mg again? I realize it would be off-label and I’m not sure how that would work yet – especially with cost. The FDA could eventually approve the higher dose, but I don’t have any idea when. I have been on it a month and a half, maybe more. I have never had an elevated sed rate or crp. I have always had elevated globulins. For the first time ever, my globulins are in the normal range, but my sed rate went from 9 last month (highest it has been) to 20 this month (top of the range). It has never been 20! Fingers are swollen again and I haven’t slept more than 3 1/2-4 hours straight (if that) since I have started it. I have also lost 6 pounds for no reason since starting back to work 3 weeks ago (I can’t lose weight even when I try). I am wondering if this is effecting my hashimoto’s (autoimmune thyroid disease)?. hi M. you must feel exhausted by now. I’ve had hashimoto’s since age 15 – been dangerously high and low over the years, so I understand. Have you talked with your endo doc? Maybe for some reason it is more active and you need to adjust t-meds. they even have thyroid suppressing hormone now – they didn’t have that when mine has been sky-high. I tend to suspect the same thing – that the two can be connected. I had a good endo doc tell me to do whatever I could to keep my thyroid in check in case it would help stabilize my RA. So far it didn’t help but life is better when they t-levels are right & stable. Kelly, you blog a lot about how awful the rheumatologists you have seen are. Mine is fantastic (I am thankful), however I really relate to your bad rheumatologist stories by thinking about my awful endocrinologists! Have had hashi’s for 10 years maybe, 5 different endocrinologists, all awful. The current one is negligent at best. When I first went to him he insisted I did not have hashis, I had one bad test and all the other doctors just went along, so he insisted on retesting. Lo and behold, it came back very high positive. He broke the news to me as if he were the doctor who had discovered my hashis and told me it would be ok I would just have to take a little pill for the rest of my life. I only tolerate this clown because I only have to see him twice a year as opposed to the every 6 weeks the other doctor was seeing me (so I could drive 40 miles, sit in his waiting room 2 hours and literally have 5 minutes of his time). Your right, I am tired, tired of these doctors! I see both my rheumy and endo. this week, hopefully we can figure something out. Thank you!